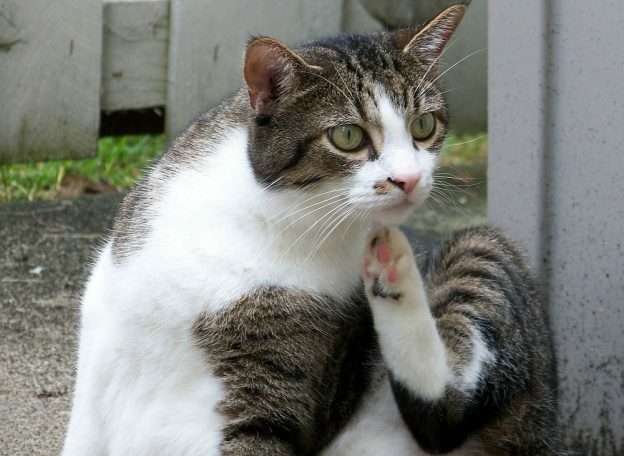 What hazards do your cat’s fleas pose to your health? Fleas are the scourge of animal lovers worldwide. Fleas live off of the blood of their host animal, causing intolerable and relentless itching. Animals that suffer allergic reactions to the bites require medical intervention. The fleas can cause even more serious health conditions since serious flea infestations can make the host animal anemic or infect them with parasitic worms. But fleas do not pose a health danger to just animals alone; fleas can cause illnesses in people too. Cat fleas are carriers of the murine typhus disease. When a human is a bit by cat fleas that carries this disease, the person can then become infected with the disease. The fleas will defecate on the person as it feeds on their blood. If the person than scratches the bite and rubs the feces into the skin, the person can then become infected with the disease known as endemic typhus. Symptoms of the disease include fever, headaches, chills, and often a rash. Treatment of endemic typhus is administered by an antibiotic. Cat fleas can also cause other health ailments in humans. Flea bites can cause a person to develop a rash known as fleabite dermatitis. This usually occurs when the person has an allergic reaction to the saliva in the flea bites. Fleas can also carry tapeworms that can be ingested by humans. Both illnesses are treatable but can cause discomfort to the person unlucky enough to be afflicted. So now you know, fleas are not just a problem for the animals. Fleas carry diseases that are a hazard to humans as well. If your cat has fleas, it is important to treat immediately. The longer you delay treatment, the worse your flea infestation will become. Once the fleas begin to move into the environment, the people that reside in the infested habitat will be more likely to suffer flea bites. And the flea bites can lead to one of the conditions above. This entry was posted in Lifestyle on February 13, 2018 by Alisha Amelia.